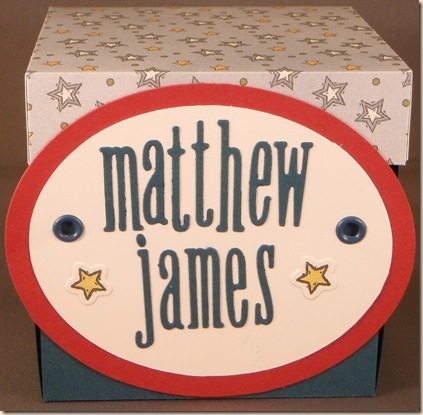 My Crafts are Like a Box of Chocolates – Page 109 – You Never Know What I’m Going to Make! Do you find it hard to make manly cards? Me too, even if it is only for my DH. You think it would be easier knowing someone for 11 years! Yeah I know, 11 year anniversary… known him 11 years… doesn’t add up. In case you are wondering, I was not a mail order bride 😉 but we did get married very quickly after meeting, less than 6 months, so I guess technically I have known him for 11 and a half years! 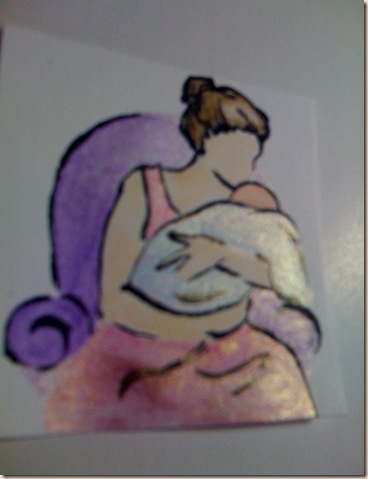 This card is basic, an easy layout, definitely masculine but I managed to add embellishments anyway. 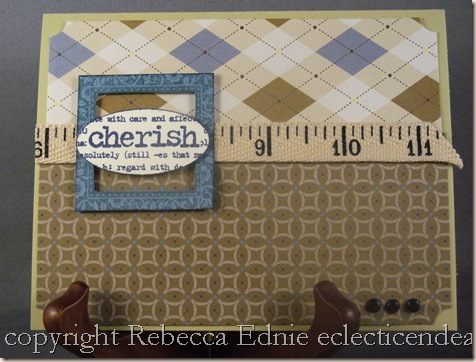 I thought it was a neat idea to use the tape measure twill tape cut at 11″ to represent 11 years of marriage. I wonder how long it will take for him to notice. 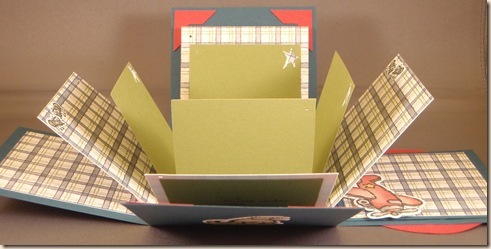 I started with a card base of River Rock, then added 2 pieces of ticket corner punched Designer Series Paper. I glued the twill tape over the seam. Then I stamped the square from Frames and Flourishes in Blue Bayou ink on the same colour paper and cut out the center. I used foam dots to lift the frame up over the twill tape. The foam dots are SUPER sticky ones sold by Jody at her blog. The dots have the same adhesive on them as red line tape!! She also sells lots of other cool sticky stuff. I stamped ‘cherish’ from Lexicon of Love with Night of Navy ink on Vanilla CS, punched it with the oval punch and distressed the edges with navy ink to help it stand out. I realized you couldn’t read the details of the stamp after punching it so I stamped it in the inside as well. It looked a bit boring so I added three brads to the bottom. Hope it inspired you to make some great man cards! I made these for a craft sale and they didn’t sell, oh well. At least I get to blog about them now! Instructions for making these are here. It is very easy to follow Andrea’s directions. The only thing I changed is switching the order of adhering the side pieces of patterned paper to the cardstock base. They are two different widths, she has the wider paper adhered first and the narrower second. I prefer the wider paper on the outside (adhered second) so when you look at th e purse from the front, the ‘sideseams’ are as far from view as possible. A small detail but sometimes the beauty is in the details. I tried another small variation with one and wished I hadn’t so I won’t even tell you what it was! 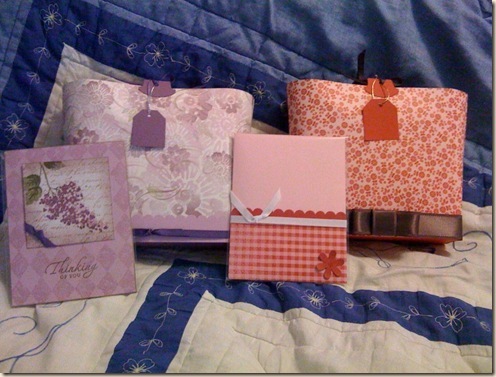 Inside are 4 cards with envelopes, one from each set are pictured. You could fit a lot more than that, at least 8 I think. They are all a bit different, the pink ones are all verse-less, the plum ones have various verses on them, general sentiments anyone can use. In retrospect, I think the pink ones are a bit too plain, I had intended to stamp the pink pirouette card base with a background stamp but forgot. Even so, these are very elegant and a great gift. I find that everyone I know LOVES getting sets of cards as gifts from me. It would also be great just as a gift bag for any type of present, not just cards. They are pretty strong and would be even more so if made with double-sided cardstock instead of Designer paper. I would love to get comments on what price point these should be set at. I guess you need to know the area because prices vary depending on where you live. I live in Mount Albert, a small town, partly rural suburb of Toronto. We are about 1 hour commute right to the centre of the city, the north edge is only about 30 minutes away, less in good traffic. I have heard of some gals getting $6-10 for one card in exclusive boutiques in tourist areas or big cities while others sell their cards for $2 or less in rural areas or on Etsy.com because of the high level of competition for sales. At the craft sale, I set my cards at $4.50 each or 5 for $20 so I figured this set priced at $22.50 was fair. 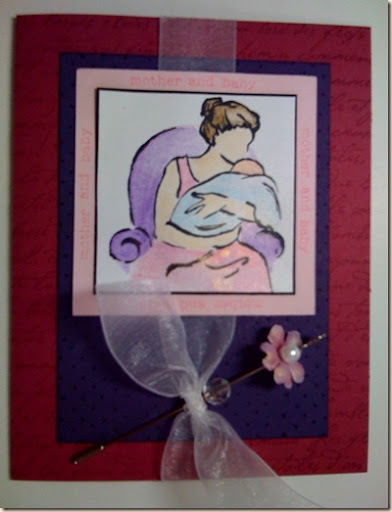 All cards included some type of embellishments, like ribbon, rhinestones or buttons, not just paper layers. Leave comments below or email me! Accessories: tab punch, chocolate ribbon, gold cord, silver cord, white and eggplant grosgrain ribbon, flower punch, scallop punch, gold EP, stipple brush, red line tape, glue dots. Unfortunately I needed a sympathy card this week. It took me a long time to get it right; funny considering how simple it ended up. For the sentiment, I started with a chipboard label I covered with rose red CS and edged with a gold marker, it just looked clunky so I redesigned it. The edges of the confetti white panel and the oval tag are stipple brushed with chocolate chip ink. I hand cut the chocolate chip oval, I can’t wait til I get my nesties! Cardstock- more mustard, confetti white, chocolate chip all by SU! Stamp sets- Sincerely Sunflower, thoughts stamp from unknown set, French background, all SU! Here is the interior of the project I showed you yesterday. I decided to break it into 2 parts because I didn’t want my posts to get too long and I didn’t get much done on the weekend either (so not too many things to blog about this week)! In the photo you can see all of the pages inside. There were lots of scraps from the corners of the pages that were cut off (each interior section is cut from one piece of paper) so I tried to use them up. You can see I used two of the corners from the plaid paper in the interiors of two of the blue pages. One of them covers up the eyelet holes from the front panel. 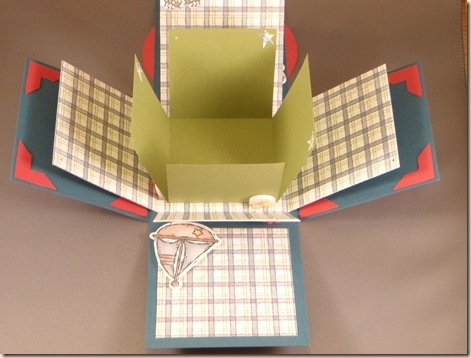 Each interior page has a 1/16″ hole in the top corner. Although not pictured, I made about a dozen little tags using the word window punch, leftover plaid paper stamped in not quite navy and riding hood red using combinations of words from Everyday Flexible Phrases, like ‘special boy’, ‘mother and baby’, ‘summer vacation’ etc. I put the tags and silver cord in a little bag to include with the scrapbook. That way the mom and dad can add the tags where appropriate. On advice of my 7 year old, Jameson, I added a few blank ones so they could write in anything else they wanted. You can just barely see one in the second photo, but I used the Basic Grey half circle cutter to punch the equivalent of photo corners into four leftover corners of the olive cardstock. This will allow the parents to slide photos under the corners, then I adhered them to the back of the patterned paper making sure not to use adhesive in the corners. I even measured the photo size needed and wrote it in with pencil. I think she scrapbooks a little so hopefully has a paper cutter but if I was giving this to a non-scrapbooker, I would cut a piece of scrap cardstock in the sizes required for all pages and include it inside. Each page is embellished with something but I kept it very limited to leave lots room for photos. Some pages have stickers or punched shapes on them, on others the stickers are lifted up on foam tape and I used my powder brush to spread powder all over the adhesive on the back, except the foam tape of course, so it is lifted up and the photo can slide under. Other pages have buttons with tiny embellishments glue dotted on. The red photo corners are similarly glued on with just the outer edges adhered with 1/8″ red line tape so the photo can slip under. I am really pleased with this project, I can’t wait to give it to her. If it didn’t have the baby’s name on it, I would be tempted to keep it for my youngest! At least I have enough left from the kit to make another! My older son is dying to make one too. A good project for him I think, perhaps we will make some together! Forgotten in the recipe in post 1: glue dots, foam tape. Thanks for reading! I had a lot of fun making this cute box/scrapbook. I needed a gift for a friend’s newborn baby boy so I decided I would go back to a link I saved for the instructions. It opens up with 8 double sided pages inside as well as the interior of the outer walls. The inside is decorated and I used a variety of methods to make it easy to add photos to the pages. The stickers and paper are from Toy Box, a retired scrapbook kit by SU! I hope to teach a class for this project next Saturday night. Paper- riding hood red, not quite navy, whisper white, old olive cardstock, patterned papers from scrapbook kit all SU! Accessories- Eyelets by WRMK, stickers from scrapbook kit, Coluzzle, buttons, boy-themed embellishments Dress It Up (I think), red line tape, Quikutz die cuts for letters. Word window, 1/16″ hole and corner punches, silver cord all from SU!. Powder brush from EK Success, star punch from dollar store, Basic Grey half circle cutter, Big Bite by Crop-o-dile. Yeah, I now realize the tag is a bit crooked, OOPS! I will post the interior tomorrow. Have a good day! This card is for a girlfriend of mine I have been missing lately. We just never seen to manage to get together even though we don’t live far apart. I would have made an ‘I miss you’ card but can you believe it? I have thousands of rubber stamps (NOT counting alphabets separately) but not one ‘I miss you’ stamp! So I just decided to make something beautiful that would also work for the week’s challenges. I started with the colour challenge for this week, CC 191, pretty in pink, riding hood red and kiwi kiss. I decided on a pink card base, 4.25×5.5″ as usual, I scallop punched the edge but it really didn’t do much for the card because you could still see the straight edge of the back of the card beyond. I put Bella Rosa patterned paper under the edge, rounded the corners and liked it much better. The back corners didn’t look right now so I got out my corner punch and rounded them. I really don’t use it much so imagine how surprised I was when I looked at the Ways to Use It challenge 191 and it was to use a corner punch! Next I punched holes in each scallop with my Big Bite, again it didn’t have enough impact, so I put another strip of designer paper under the edge so kiwi kiss showed through. The paper is actually dotted so I aligned it so the dots didn’t show. On the inside I made sure the second layer of paper covered the first so it looks tidy inside. Then I looked at the sketch challenge, SC 201. It didn’t work very well in portrait orientation with my border because the sketch is so symmetrical, so I flipped it to landscape. I layered riding hood red cardstock and another paper from Bella Rosa. Now all I had to do was pick a stamp that worked with the orientation of the sketch. Recently, in my web travels either on Splitcoast or while blogging, I saw someone use Natural Beauty, stamping the words almost as a background with the bird over top. I can’t remember if the bird was cut separately and popped up or masked but it was lovely. So I CASE’d the idea only using the butterfly and adding it to the side rather than in the centre of the words. The words were stamped on confetti white paper with pretty in pink ink all over, then one side inked with riding hood red and spritzed with water. I had hoped the colours would bleed more but oh well. I stamped the butterfly on whisper white paper with black Adirondack ink, hoping to colours it with Copics but since the colours I have didn’t match, I went back to my oldies but goodies, my Stampin’ Up! markers. Had I known I would use those, I would have stamped with Staz-on, instead I just coloured very carefully. I used pretty in pink, real red and old olive markers, then added 2 four mm ( millimetre, about 1/8″) green Swarovski heat set crystals to the wings. I didn’t want to get out my hot fix crystal setter for two crystals so I held them with tweezers under my heat gun; worked really well. When I cut out the butterfly, I slit between the upper and lower wings. This allowed me to get more depth when I popped up the upper wings. The body is adhered with a glue dot, the upper wings have foam tape rolled up under the wings to make a very solid base. I hate when I use foam tape and it squashes flat under pressure, either from mailing or being stuck in my purse til I give it away! So I used a strip of tape, 1″x 1/4″ and rolled up the end so it is tight, therefore not easily squishable, and extra high. Before assembling the card I very lightly inked all layers with riding hood red. The corner stamp is from Frames and Flourishes, stamped in pink ink. The only major problem I had was getting all the layers parallel to each other, I had to move several and though I LOVE the new double stick tape I am using, the Glue Glider Pro, it is really, Really, REALLY sticky, making the layers almost impossible to adjust. It is worth it though to know my cards will NOT be coming apart! One thing you can’t see in the photo is that the front of the card is about 1/8″ smaller than the back leaving a border of pink next to the patterned paper edge. When DH took the photo he didn’t realize it needed to be photographed closed for best effect. We were trying out my new light box set up. the photos are much better now, especially since we used a real camera, not my iPhone! I haven’t gotten around to doing anything crafty lately except tidying my space. I was long overdue to put some stuff away properly, not just shoved on top of something else. 🙂 So here is a card I made ages ago. It is pretty easy to make so I will just list the ‘recipe’ below. Pale plum layer is mounted under the square punched hole, the flower is mounted on the back of the card so it is seen when the card is open. 1. A good selection of cardstock in favourite colours and some basic neutrals like Kraft, black, white, vanilla and a speckled white like confetti white by SU! 4. Clear rhinestones in tiny, small and large, I prefer Swarovskis, of course other colours are available but to start, white always works! 9. Prima flowers, start with white, they dye nicely with ink pads, brayer them right on the pad! 10. Eyelet setting kit or Big Bite – my fav! Others mentioned a paper piercer which can also be used for making a hole for brads, I use a sharp, big embroidery needle, very cheap! -Coluzzle circle and oval templates with cutter (I am getting Nestabilities but if you are starting out, this is way cheaper), I also like the templates for 3-D items, then it is good to have the scorer. I can’t wait to get my Cuttlebug (just won on Ebay) and Nestabilities-I am going for label1, circles and scalloped circles first! I started with a stamp I have had almost since the beginning of my stamping career. The minute I saw this I had to have it because it illustrates exactly how I feel about my babies. A lot of parents say that they love it when their kids are past the newborn stage when they have ‘more personality’ but my happiest memories are of cradling my babies just like this. I still get to cradle the little one like this, thank goodness! So Technique Challenge 191 was to use watercolour pencils to colour in an image, then to use pink (in honour of breast cancer week) Twinkling H2Os in the water used to blend the watercolour pencil. Interesting to say the least but I don’t have any ‘Twinks’! so I had to substitute. I like how the pink gold pearl ex makes the pale blue baby blanket look kind of purplish. I didn’t expect it to affect the colour that much. This angle doesn’t show it but I even used it in her hair! When it came to choosing a sketch, I didn’t really have anything in mind. So I started by layering the image on black CS to give it a nice clean thin edge. In the spirit of breast cancer week (OK maybe it was last week but anyhow), I used a pink pirouette panel underneath. Now I went back to the tiny word sets I have resurrected lately. 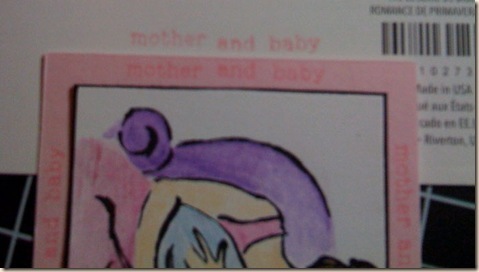 I wanted to stamp ‘mother and baby’ evenly around the edge but I wasn’t sure how to get it centred. I decided to stamp them on scratch paper and align my card stock edge and copy the spacing as I stamped each edge. 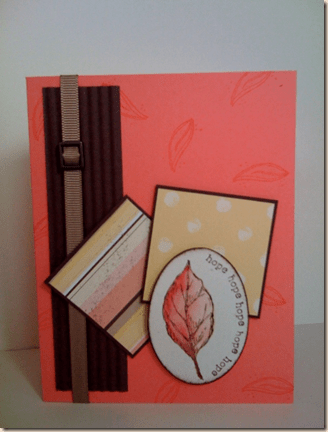 Next I looked in the past Sketch Challenges at Splitcoast Stampers for a layout I liked. I finally found one that would work for my image, Sketch Challenge 185. I love that I have so many sketches right at hand ready to look through. Thanks Splitcoast! The final card uses Purely Pomegranate as the base with French Script stamped in it in Versamark and a panel of Elegant Eggplant stamped with the little dots from Itty Bitty Backgrounds using the same ink. The ribbon is white organza and the head pin is from the SU! pretties kit. I decided the flower was too white so I pressed it into my Versamark Pad and then brushed on more Pearl Ex with a dry watercolour brush. So far it seems to stick. Hope you like it! I am in love with this clipboard! 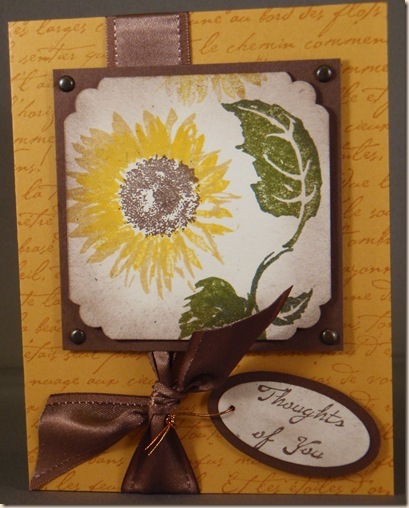 From Stampin’ Up!, it is heavyweight chipboard, 13″x7.5″ with beautiful, antiqued metal clips, not the ordinary shiny chrome look you get at the dollar store or Staples and the triple clip style is so unique! I have been dying to decorate one since they came out but with a new baby, it didn’t happen ’til now (I know, he isn’t so new anymore). I can’t wait to hang it in our kitchen. So learn to make your own! It makes a great gift for someone you love. The frame allows you to interchange the photos so maybe make it for someone who needs a place to keep the pictures of you or your kids you send them! My photo doesn’t do it justice, it is so much prettier IRL! Hoping for instructions to make this clipboard? I teach this class on November 22, 7pm but I will probably post instructions after that for all of you too far away to join me. I hope some of you visiting this site are checking it out because you live close enough to take the class! Be sure to confirm before November 8 to reserve your spot, spaces are limited. 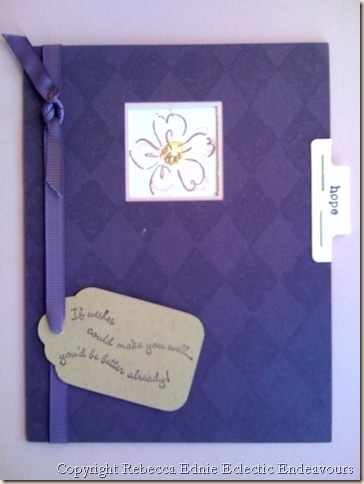 The class fee is $15, the clipboard cost is $23.50 (cost from Stampin’ Up! includes taxes and shipping), you will also need to bring at least two pieces of 12″x12″ patterned paper, I recommend three, matching cardstock and your choice of ribbon and embellishments. Keep in mind I have a Crop-a- dile Big Bite so if you have any fancy brads or eyelets you would like to use, we can set them right into the clipboard. Instead of bringing your own paper, you can buy a pack of 12 sheets of coordinating, double- sided Designer Series paper for $14.50 (taxes and shipping included). Go to stampinup.com to see all the available patterns. I can get anything else you need at the same time if you wish. If you need ribbon, let me know ahead of time to see if I have the colours you need and I can sell you some very reasonably. I provide everything else you need; tools, adhesives, cutters, glaze, stamps and ink as well as the calendar and to do list. If you would prefer to bring nothing and buy a kit with everything you need, let me know and we will work something out. The patterned paper is retired SU! Some of the ribbons are SU!, some are from my stash. The verse on the tag is from the Old Island Stamp Company, originally it was in a line but I inked and stamped it in segments so it would fit. 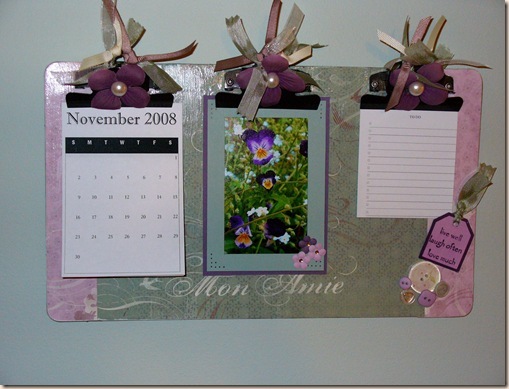 The frame opens up so you can change the photo throughout the year and is made from pale plum, sage and perfect plum including they flowers; they look like Prima flowers but are actually SU! cardstock I punched and formed using the instructions found here. The buttons are from my stash except the clear one from SU! The flowers on the clips are from the SU! Pretties kit and dyed to match; the half- back pearls are from the same kit. The pads of paper are homemade, can you believe you can actually buy the glue used to make pads of paper? It is called padding compound and I got mine online, I just can’t find the link, sorry. If you Google Sparco Padding compound, you will get tons of links. I have enough to make more notepads than I could ever use and it was only $8 plus shipping! So we will make our own to do list and calendar pad. The nice things about making your own are that you can print your own pages, make it your own size and shape and decorate the pages with stamps. I didn’t get to decorate mine before I took the pictures. You can see I made my to do list smaller so it would fit in the area I had left. I suppose the cons are the extra work and it is almost impossible to get the pages exactly the same size. Please don’t forget to subscribe to the email updates from Feedblitz so you never miss a post! Three challenges in one card! Thing about these challenges, they encourage me to try things I might not otherwise think to try. I’m sure I will come up with some non-challenge cards but since I am having so much fun doing these, I am in no hurry. Now I just have to get around to posting them to the right galleries, not just here. The Limited Supply Challenge 191 was: Use a leaf image as a focal point and use pink for breast cancer week. I hope coral is close enough to pink. Ways to Use it 189: Choose one word as a sentiment, in recognition of Breast cancer week, make it something inspirational like courage, soar etc. 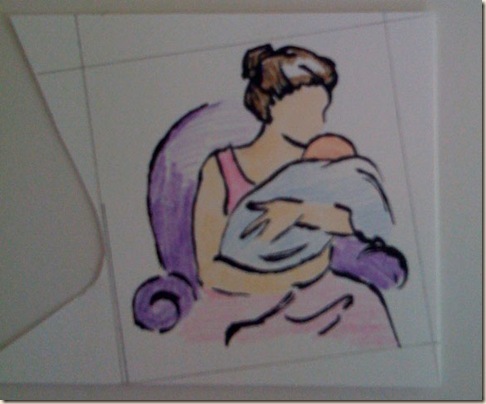 The last challenge was for a sketch challenge SFYTT at I heart 2 stamp (see link on sidebar). I love using these little words, I know I used mine more than once but the challenge was to choose one word, it didn’t say you couldn’t use it repeatedly! It also helped offset my crooked stamping. I would have stamped first and used the Coluzzle to cut it out after, except I was using a scrap and cut the oval out first. 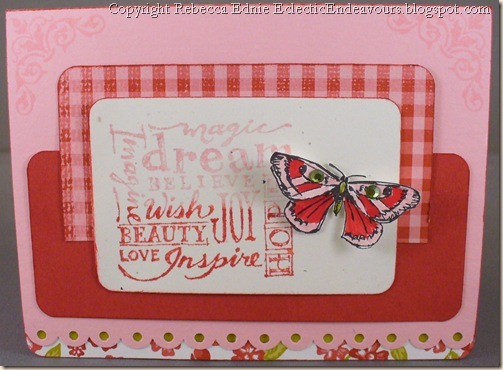 The card base is Cameo Coral stamped with a little leaf, I forget which set it is from, in the same ink. The squares are a retired SU! designer paper matted with chocolate chip CS. The oval is confetti white CS edged with chocolate chip ink. The leaf is from Natural Beauty stamped in Staz-On ink and watercoloured in with Ruby Red, Cameo Coral and Chocolate Chip. The ribbon is threaded with a buckle from Copper Hodge Podge Hardware.